Generally, when we say “O positive” (O+), we are talking about the most common blood type. 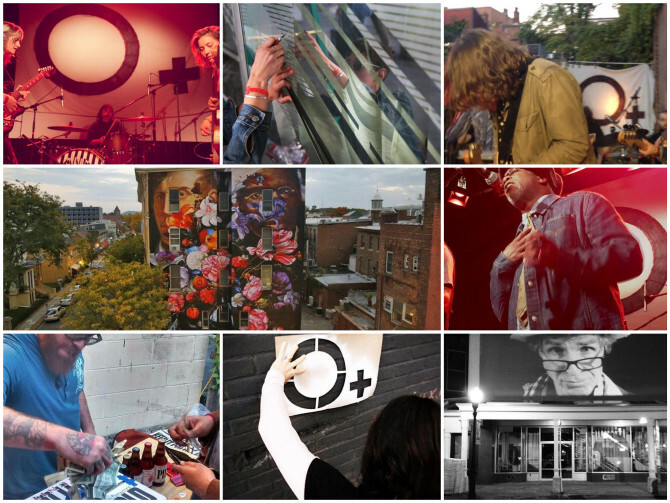 However, for the last six years, when the term O+ is mentioned in the Hudson Valley, it refers to a festival aiming to motivate arts and health professionals to exchange services while the Kingston community enjoys a weekend of art, health and partying. On this occasion, the festival, to be held Oct. 7 to 9, seems to be pulling no stops, as its calendar features more than 60 bands who will entertain the crowd and over 30 artists participating in exhibitions and mural painting. Because Hispanics are the largest group carrying O+ blood in the world and the theme of this year’s festival is “Mothers of Invention,” a “mother of invention” of Latino descent had to be present at the event. This is how Gardiner, New York, resident and native Ecuadorean Sandra Fabara, better known as Lady Pink, came here to show her talent. The artist, a renowned legend of graffiti art, has managed to dodge the police and paint her artwork on subway cars and the walls of New York City from the 1970s to this day. Even though her work is on display at New York’s Metropolitan Museum of Art and Whitney Museum, as well as other prestigious art institutions around the world, Lady Pink feels most at home when she is painting murals. Her themes usually depict indigenous cultures and social issues, often questioning the bad policies carried out by governments, the police and other institutions. The mural the artist, born in the Ecuadorean city of Ambato, will create this time is called “Orgullo Latino” – “Latino Pride” – and will be painted on one of the walls of Express Latinos, a shop located at 670 Broadway in midtown Kingston, owned by a fellow Ecuadorean. One of the things the artist enjoys the most is chatting with members of the community while she works. It goes without saying that everyone is invited to witness how a Lady Pink mural comes to life, color by color and stroke by stroke. The Ecuadorean painter says that her art is not necessarily meant to decorate the walls of luxury mansions or make her wealthy, but to bring joy to people. “The truth is that, to me, there’s nothing like seeing the smile my murals can bring to the people who see them as they walk by them in the morning on their way to work,” said Lady Pink. The “Orgullo Latino” mural, which will take three days to make, is the artist’s donation to the Kingston community. In turn, the festival will give Lady Pink a coupon of sorts to see a health provider who will also be donating – rather, exchanging – their labor for art, whether it is a ticket to see a concert or a dance performance, or to acquire a painting.